Innovation is the fundamental engine of long-term growth, and is crucial to enabling economies to grow sustainably. Industrialised countries already enjoy the benefits of past innovations that have sharply increased resource efficiency. New and emerging technologies could allow them to go even further, while enabling developing nations to “leapfrog” to highly productive, low-carbon economies and improved living conditions. Materials science and digitisation hold particularly great potential for economic growth and climate change mitigation alike. Combined with business model innovations, technological advances in these fields are driving rapid progress in renewable energy and energy efficiency. They are also transforming multiple other sectors in both rich and poor countries, including personal transport, buildings, manufacturing, agriculture and consumer goods. One example is a shift to “circular” business models, which dramatically reduce the material and energy-intensity of production systems through greater durability and reuse of key product components, and could add up to US$1 trillion to the global economy by 2025. The potential for innovations to accelerate the transition to a low-carbon economy is enormous, but there are real barriers, including the market scale, sunk costs and entrenched incentives for incumbent high-carbon technologies. For example, in the construction sector, leading players have shown the potential to achieve radical efficiency gains, but those innovations have yet to be widely adopted. Energy-sector public research and development (R&D) is less than half of what it was in the late 1970s, in real terms, even amid growing concern about air pollution, energy security and climate change. Knowledge generated by clean tech R&D in particular has spillover benefits comparable to those from robotics, IT and nanotechnologies, and new patents associated with clean-tech R&D are much likelier to be used by other fields than those associated with fossil fuel-based technologies. Stronger incentives for low-carbon innovation – including much greater support for R&D, which has social returns estimated at 30-70% – could lead to large economic benefits while lowering the costs of climate risk management. Support for market creation is also vital, but needs to be carefully tailored to overcome specific market barriers, and to avoid subsidies that are excessive or inhibit competition. International collaboration, including financing, technical support and expanded use of patent pools, is essential to making low-carbon and climate-resilient technologies available to lower-income countries, and ensuring they have the capacity to adopt and adapt them. Innovation is central to economic growth, as long-term trends in productivity and growth are largely determined by trends in innovation. The importance of innovation is a recurring theme throughout this report; it is essential to transforming global energy systems, agriculture and cities – every aspect of the economy. It also depends on and is shaped by factors discussed in other chapters, from investment strategies, to effective regulation of markets, to international climate policy. Innovation also makes it possible to continue growing our economies in a world of finite resources. 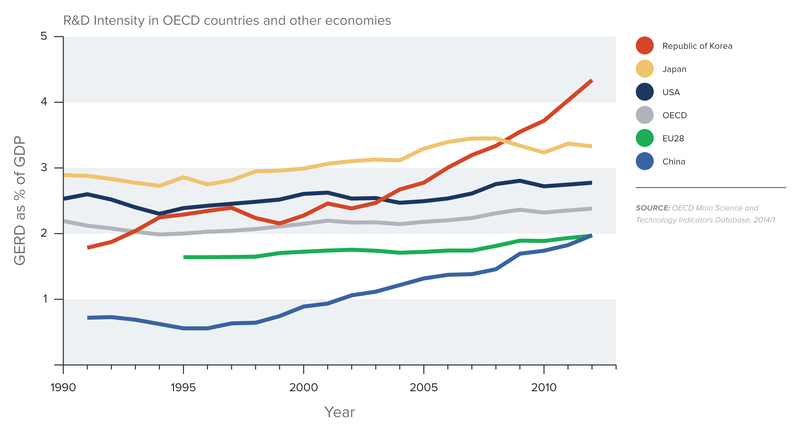 The Organisation for Economic Co-operation and Development (OECD) has projected that if current trends continue, as the world population grows from 7 billion in 2010 to more than 9 billion in 2050, per capita consumption will more than triple, from roughly US$6,600 to US$19,700 per year, and global GDP will nearly quadruple, requiring 80% more energy. 1 Achieving growth at anywhere near that scale, sustainably, will only be possible with radically new business models, products and means of production. The Green Revolution, which transformed agriculture in the 20th century, allowed humanity to grow more food than ever, by leveraging new technologies. Similarly, new technologies today, from smart meters to satellites, are helping societies use resources more productively. This chapter explores the role of innovation in building a strong, low-carbon economy. We begin by discussing two fundamental areas of innovation where rapid, transformative advances are being made – materials science and digitisation – and gauge their potential to accelerate the transition to a low-carbon economy, based on trends that are already being observed. In doing so, we also demonstrate the importance of business model innovations that leverage technological possibilities to transform markets. Innovations in materials and digitisation are already making an impact across the global economy, increasing productivity, reshaping entire industries, and creating opportunities for “leapfrogging”, by skipping less efficient and more polluting stages of development. The impact of digitisation can be seen in “big data” – the large and complex data sets that are now available thanks to digital technology. Virginia Rometty, chief executive of IBM, has described it as “a vast new natural resource, which promises to be for the 21st century what steam power was for the 18th, electricity for the 19th and hydrocarbons for the 20th”. 3 As more and more devices in our homes, businesses and public infrastructure are connected to data networks, they have the potential to dramatically increase efficiency, reducing consumption of energy and other resources. Digitisation and materials science, in tandem with innovative business models, are driving economic growth, both through incremental improvements and dramatic disruption of existing industries. The question we seek to answer below is how these forces such forces of innovation can support the transition to a low-carbon economy. The potential for innovation in areas such as new materials and digitisation to accelerate and increase the efficiency of the transition to a low-carbon, resource-efficient and resilient economy is enormous. In fact, such innovation is already reducing climate risk. Looking ahead, the potential remains large. New advances in materials will continue to drive improvements in renewable energy, and energy efficiency across the transport, buildings and industrial sectors. 8 By 2020, it is estimated that the US corporate sector could save US$120 billion in annual costs, and reduce annual emissions by 890 million tonnes of CO2e, by utilising renewable energy and energy efficiency technologies,9 most of which rely on improved materials Advances in materials are also critical to improving energy storage, and carbon capture, use and storage. This will include incremental improvements in existing materials, as well as the application of more advanced materials, such as nanomaterials. Adoption of digital technologies is gaining traction through a range of new business models that reduce capital- and energy intensity across the economy. It makes it possible to share assets, such as “cloud” storage and online servers, or dispense with them altogether by working remotely and digitising information. Even in mature manufacturing industries, traditional process controls are intersecting with system automation to transform factory efficiency. Ten years ago, energy was too cheap and data too expensive for this to be feasible. Today, the shift in relative prices is changing the picture. Cloud computing is particularly promising, as research shows it can increase efficiency and reduce companies’ overhead costs, and energy usage and related emissions. 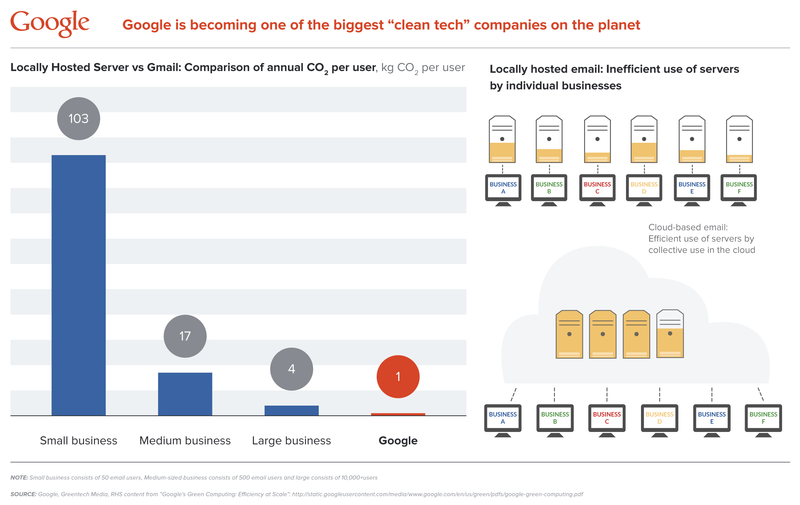 For example, for an office with 50 people, Google estimates IT energy use at 175 kWh per person per year, compared with 2.2 kWh when using Gmail (see Figure 1). 10 Cloud computing also reduces the need for in-house hardware and software expertise, which can be particularly helpful in poorer countries where such skills are less widely available. In that sense, information technology is effectively replacing capital in many cases. Thus, while there is considerable evidence to suggest that a low-carbon economy will be relatively capital-intensive, due to the capital costs of renewable power, efficient buildings, smart appliances and electric vehicles, digital technologies could significantly offset those capital costs. Digital technologies are also changing behaviours at the individual level, in ways that could dramatically reduce GHG emissions. Digital apps facilitate car- and ride-sharing schemes, guide riders through public transit, and help motorists avoid congested roads and find parking more quickly; services such as shopping and banking have moved online, reducing the need to travel. In our homes, data-rich systems are increasingly able to control heating and lighting on a much more reliable basis. In some cases, these technologies have the potential to scale rapidly: China has already installed nearly 250 million smart meters. 11 They can also create opportunities for lower-income countries to leapfrog higher-income countries – such as by using decentralised renewable energy sources and micro-grids to quickly and reliably electrify remote and hard-to-reach areas or provide backup for emergencies. Below we look in more detail at examples of the impact of these and other key trends on both developed and developing countries. We also discuss how low-carbon technologies themselves are feeding back into, and accelerating, the underlying innovation trends. Many companies are now looking to an alternative to the linear model, attempting to recycle, reuse and remanufacture wherever possible. Materials-related innovation is at the heart of the “circular economy”, and new materials technologies can facilitate the transition, with better conversion of used materials to new materials. Similarly, digital technology supports market creation, helping to match used goods with potential reuse or remanufacture markets. This can help substantially with monitoring the product “phase”, hence facilitating the reuse of product parts. Caterpillar, the American machinery and engine manufacturer, has been in the remanufacturing business for almost 40 years. Its Cat Reman activities have improved and expanded over the years, and now employ 8,000 workers spread in 68 plants in 15 countries. Materials make up almost two-thirds of Caterpillar’s costs. Through Cat Reman, the company disassembles products (called “core”) at the end of their lives, cleans all the parts, and salvages all that is reusable. This allows the company to boost profit margins, make “same-as-new”-condition products available to customers at a fraction of the cost of new ones, and in the process, reduce waste and greenhouse gas emissions. In order to intercept products before they break, it is crucial to have consistent knowledge of the condition of the key components. Typically, this is monitored through a regular and simplified maintenance process between the dealer and the customer, but Caterpillar is now beginning to use digital technology to add a “Product Link” service to units in the field. This service provides customers with information about the condition of their equipment, through a satellite connection to a network of Caterpillar dealers. The pricing structure for remanufactured products is different than for new products: an important part of the pricing is a core deposit, roughly equal to that of the unit itself. Increasing core recovery rates is a challenge for any manufacturer engaging in remanufacturing activity, so offering an economic incentive to return the component is a crucial part of the business model. An additional advantage of remanufacturing is its faster turnaround of products, allowing delivery of remanufactured products at a fraction of the time required for delivering a brand-new piece of equipment, an important feature in fast-growing economies. The practice of restoring used products for resale is expanding rapidly. The United States is the largest remanufacturer in the world, according to a recent US International Trade Commission (ITC) report. 13 The domestic remanufacturing industry grew by 15% between 2009 and 2011 to at least $43.0 billion, supporting 180,000 full-time US jobs. Even in the midst of a recession, every single remanufacturing sector sampled by the ITC reported some growth. The market has huge profit potential. Should economies successfully move to circular models, the Ellen MacArthur Foundation estimates that over US$1 trillion a year could be generated for the global economy by 2025, with 100,000 new jobs created for the next five years, while also reducing greenhouse gas emissions. However, capturing these benefits requires businesses to operate in new ways, with high cross-sector collaboration and alignment. A marked shift to a circular economic model would require new skills and systems in areas such as reverse logistics and service-based revenue models. It also requires regulatory change, from better labelling, to reduced consumption taxes on goods with refurbished components. Existing laws and regulations may stand in the way; for example, regulations on end-of-life of products and waste can prohibit higher-value reuse or remanufacture. The value-added tax (VAT) treatment can make a huge difference to the incentives for a circular economy. Effectively, without the right treatment, VAT can discriminate against reuse/remanufacturing, because it re-taxes goods at every stage of recycling of the product into the market. Buildings consume 32% of global energy and produce 19% of energy-related GHG emissions, 15 and the sector is expected to continue to grow substantially in the next few decades, fuelled by urbanisation in the developing world. For both economic and environmental reasons, it is important to maximise the efficiency with which energy and materials are used in construction, and the efficiency of new buildings once they are occupied. Nonetheless, the buildings value chain has the potential for very substantial improvement in economic value creation through three different levers: new products, process efficiency in cement and steel, and circular business models. Digitisation and use of new materials cut across the levers, helping to enable previously inconceivable improvements. Nonetheless, the buildings value chain has huge potential for improving energy efficiency, reducing GHG impacts and creating economic value through various levers, including new products that reduce building energy use, modular construction and pre-assembly, improved building materials, process efficiency in cement and steel, circular business models, and sustainable architectural design. Digitisation and use of new materials cut across the levers, helping to enable previously inconceivable improvements. Modern technologies are also changing the building process. Modular construction and pre-assembly strategies could significantly reduce raw material use and lower construction time. The Broad Group in China, whose CEO is quoted above, recently built a 30-storey, earthquake-resistant hotel in only 15 days through modular construction – a process that typically takes two years – and it has managed in some cases to use 96% recycled steel. 18 Pre-manufacturing the components in a factory allows builders to optimise resource use during construction, achieving efficiencies similar to a manufacturing facility. The development of wind turbines illustrates how digital and new materials technologies can transform a single product. Google donated 50 million hours of high-performance computing to use the Google Earth Engine geospatial analysis platform that brings together the world’s satellite imagery to help detect trends on the Earth’s surface. This includes an interactive time-lapse of the planet for 1984–2012. 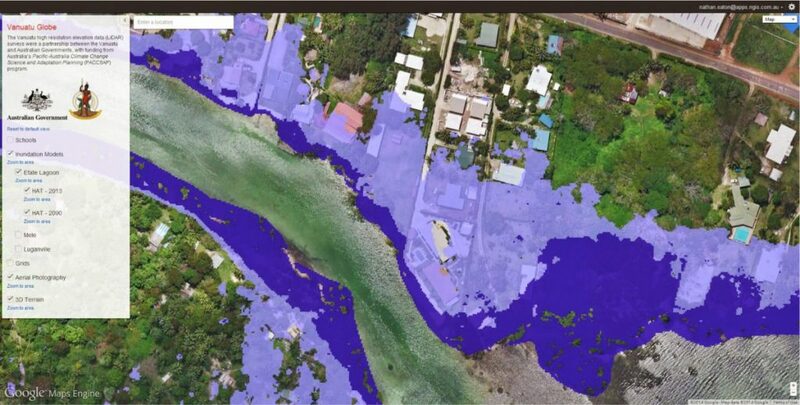 One billion megabytes of cloud storage will be made available to house satellite observations, digital elevation data, and climate/weather model datasets. Researchers and agencies from developed and developing countries are able to join in this project by contributing and curating data, and developing ad-hoc applications. As demand for low-carbon technologies grows, and innovation aimed at those technologies increases, we are seeing a virtuous cycle in which innovation aimed at low-carbon technologies itself accelerates advances in other fields. A recent analysis of patent data across countries in the OECD 31 has shown that new patents associated with clean-tech research and development (R&D) are much more likely to be used by other fields than are new patents associated with R&D in fossil fuel-based technologies. In fact, the knowledge generated by clean tech has spillover benefits to other fields comparable to the knowledge generated from R&D in robotics, IT and nanotechnologies. Another analysis, of global patenting rates across all energy technologies, shows that renewable energy patents (particularly solar and wind) have grown faster in recent years than patents in other areas (fossil and nuclear), despite there being no corresponding increase in total R&D funding. 32 The evidence suggests this increase is driven by the rapid growth in markets for clean energy technologies, and the greater overall potential for innovation in such emerging technologies. These factors together lead to a greater rate of innovation achievement at any given level of R&D funding. This demonstrates how deeply low-carbon innovation is embedded in the current wave of innovation, driving economic growth. Further, it strengthens the case for public support for low-carbon innovation, and weakens the case for public support towards fossil fuel-related technologies. Innovation is agnostic. No matter how much potential there is for innovation to advance the low-carbon transition, it will not necessarily do so – not on its own. The application of new technologies, and the innovations that they spawn, are driven by a number of factors, primarily market demand for goods and services benefitting from those innovations. Where the current wave of innovation has the strongest impact will be determined by two key factors: market demand and public policy. This section examines these two factors, with a focus on identifying and removing barriers to innovation. As discussed in the economic policy and energy chapters, to ensure our markets work efficiently, it is crucial that prices reflect the true costs of carbon and other environmental damages. Economic research shows that if these costs are not accurately reflected, investment in low-carbon technologies is likely to be lower than what would benefit society most. 33 Industry consultations by the Commission indicate a broad agreement that a strong carbon price or an equivalent policy that prices emissions would greatly accelerate the application of new technologies and new business models to low-carbon applications. 34 We discuss this further below, but first we examine several other kinds of barriers that inhibit low-carbon innovation. Generally speaking, innovations enter the economy in a continual and iterative process encompassing “invention” (the creation and development of innovations) and “diffusion” (the adoption of new, innovative products and services across the economy, often replacing old ones). 35 Different obstacles and constraints arise at different points of the process. The invention process is constrained by the fact that the value of innovations is often difficult to protect, and becomes, to an extent, widely accessible. While a technological solution, such as the formula for a new drug, can be patented, such patents can be difficult or prohibitively costly to exercise. And new business models can be copied with little payoff to the original inventor. At the same time, knowledge about, and the ability to replicate, a new technology or process can also be transferred as individuals move from one company to another. These spillover effects may be positive in terms of rapid diffusion of innovation, but they may also make businesses and financiers reluctant to invest, as the value of that innovation is difficult to protect. This market failure leads to lower-than-optimal levels of innovation. 36 Intellectual property rights are an important tool to protect innovation and create incentives for investment, but they also suffer from inherent disadvantages. We turn to this later in this chapter. The diffusion of innovation, critical to reaping its economic benefits, involves companies and households purchasing new equipment, learning new ways of doing things, or adapting their existing capital to new business models and processes. This process can be hindered by an array of market failures, most notably – but not only – the failure to accurately price environmental damages and other externalities. Market failures can hinder the uptake of innovations in several ways. For example, the success of many technologies depends on their widespread adoption. So while everyone would benefit if they all moved to the new technology, nobody has an incentive to be the first to adopt an untested technology. So-called “dynamic increasing returns” emerge gradually, 37 as early adopters are observed and copied by others, until the “learning-by-using” effect is substantial and adoption becomes widespread. This means that, absent some intervention, the adoption of such technologies would be slower than optimal. An example is smart meters, where both the effectiveness and cost of the technology depend on creating a large user base and leveraging learning-by-using effects. Related to this, achieving network economies can also be a challenge for new technologies that require new infrastructure and a critical mass of users. Government plays a key coordinating role as rule-setter. Just as governments help ensure the interoperability of electronics, requiring that different systems be compatible, they also need to set standards for new technologies and their associated infrastructure, such as electric vehicle (EV) charging and solar panel integration. EVs’ market success, for instance, depends on having a strong network of charging stations; without a large EV user base, however, there is little incentive to build charging stations. If multiple companies build incompatible networks to charge cars, this exacerbates the problem and further inhibits the growth of the network. Mandating that charging stations all follow the same technical standard will speed the rate of network growth. Another market failure relates to financing innovation. Information on new technologies is, by definition, scarce, and held primarily by the creator. This can lead to underinvestment in the adoption and diffusion of the new technologies, as investors may find it difficult to understand the new technology, and if they do finance it, they are likely to charge a premium. The added cost, in turn, will further reduce investment. Misaligned incentives can similarly inhibit profitable investment in new technologies. For example, building owners are often not the ones paying the electricity bills, so they have few incentives to invest in equipment or insulation to reduce costs for their tenants. The discussion above makes it clear that while pricing carbon and other externalities is crucial to unleashing the power of markets for a low-carbon economy, other measures also play a role in ensuring that investment in innovation flows to low-carbon technologies at the pace and scale that is optimal for the economy. The next section looks at potential solutions to these issues. Ensuring strong and fair competition through anti-trust and intellectual property regimes that protect the value of innovation and shape the diffusion of innovation. Public support for R&D can take a number of forms, including direct vs. indirect methods, and grant- vs. investment-based. It can also take place at various points in the R&D process (from experimental research to large scale demonstration), and can involve public, private or other non-government actors, or consortia of different actors. Direct, grant-based funding includes direct support for science, engineering, and other innovation-related education programmes. It includes direct financing of national labs, along with their R&D facilities and researchers. It also includes direct funding for individual R&D projects, as well as support for the creation of R&D networks across the public and private sector, and across academic researchers and commercial entities. In some cases, countries even provide direct grants as seed funding to start-ups. Additional, often lower-cost, options for indirect support include orchestrated international knowledge-sharing and outcome-based competitions. For example, the Grand Challenge for driverless vehicles 42 and the Robotics Challenge, 43 both sponsored by the US Defense Advanced Research Projects Agency (DARPA), have spurred big improvements in these nascent technologies. Still, even amid growing concern about air pollution, energy security and climate change, public funding for energy-sector R&D is lower than it was in previous eras. The US government invested $1.8 billion per year in energy R&D in 2007 (constant 2005$); in recent years this has risen to about $5 billion per year, 45 including a major one-time investment in 2009 under the American Recovery and Reinvestment Act. However, the current annual investment amount is still below the 1978 peak of $7.4 billion (constant 2005$). 46 Over the same period, health R&D spending has more than tripled and defence R&D spending more than doubled. 47 The picture is similar with the European Union. 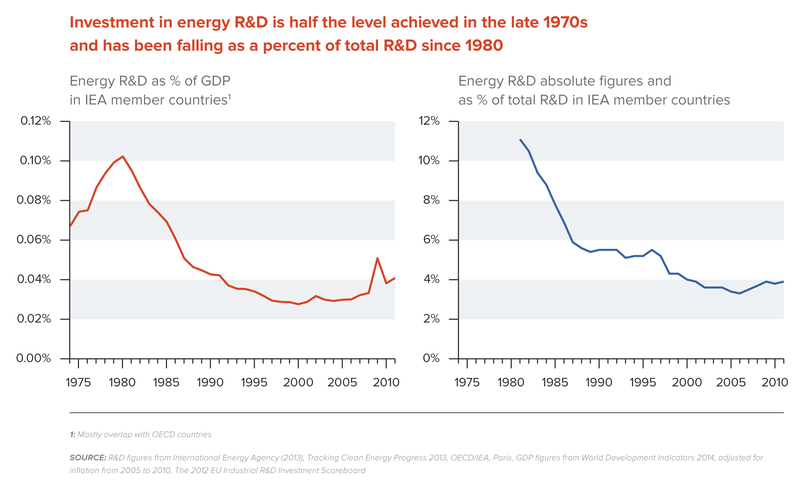 Energy R&D investments are down 32% while total R&D investment has risen 148% since 1980. 48 Several factors have contributed to this decline, including low fossil-fuel prices since the 1970s oil crisis and liberalisation of the utility industry. State-run utilities also used to run large R&D projects but have discontinued them in recent decades. Japan’s Science and Technology Agency (JST) also takes a strong and deliberate approach to R&D, focusing on a few, large-scale projects – peer-reviewed independently and carried out in partnership with different agencies and institutions, public and private. The impact of Japan’s innovation policy is well documented: its “Top Runner” programme has achieved particular success by requiring appliances to meet the best-in-class energy efficiency rate within a certain number of years, thereby raising the overall standard progressively over time. From 1997 to 2005, the energy efficiency of computers rose by 99%, of air conditioners by 68%, and of televisions by 26%. Since the financial crisis in 1997-98, however, the Korean government has tried to shift its development towards a knowledge-based and innovation economy. The country has also made increasingly strong commitments to sustainability. In 2008, Korea launched the Low Carbon, Green Growth plan, following it with a voluntary pledge in 2009 to reduce GHG emissions by 30% below business-as-usual levels by 2020. In 2010, the Framework Act on Low Carbon, Green Growth made it a priority to pursue development that combines economic growth with environment protection, backed by a “green” fiscal stimulus plan of as much as 3% of GDP, with substantial incentives for green industries. The framework also provided a vehicle for mid- to long-term strategies for emissions reductions, including a foundation for carbon emissions trading. In 2012, Korea became the first country in Asia to approve national carbon markets legislation. In 2013 the government unveiled the Korean Creative Economy initiative as the next engine of economic growth and job creation, based on “the convergence of science and technology with industry, the fusion of culture with industry, and the blossoming of creativity”. 58 The initiative can be seen as a way of harvesting the benefits of both the investment in green growth and the fast digitisation of the service sector to expand beyond previous manufacturing-oriented development strategies. In addition to directly supporting R&D activities, the public sector plays a key role in promoting the development of underlying innovation capacity, especially through support to science, technology, engineering and other innovation-related education and training programmes. Such support is particularly important in developing countries, where the lack of such capacity presents an enormous barrier to the adoption and adaptation of new technologies and business models in the local market. International support can play a major role, 59 as in the case of the Consultative Group on International Agricultural Research(CGIAR), which is discussed in depth in Chapter 3: Land Use. Another important insight from economic research is that policies should be carefully balanced to avoid “crowding out” private investment or subsidising an innovation that can stand on its own. Government policies can support the scale-up of new technologies, but good policy design will plan for the end of government support. The goal is to catalyse a market transformation in which the emerging technology becomes self-sustaining. Support to specific technologies should not become a long-term burden on taxpayers. It should not continue for technologies that have failed to develop as hoped, nor should it provide advantage to incumbent technologies in a way that is inconsistent with public policy goals. Reduction of government support sometimes happens too slowly, and mature industries may continue to benefit from measures taken when they were still nascent. 60 Continuing support for mature technologies then becomes a barrier to new technologies, obstructing the innovation cycle. Mechanisms to support the exchange of knowledge between the public and private sectors is also crucial, even at early stages of R&D, to help ensure that the innovation remains economically relevant. There is evidence of this from across sectors: from life sciences – where the complex interaction of universities, start-ups, biotechnology companies, pharmaceutical firms, government and venture capitalists has often led to significant innovation and very rapid diffusion – to the agriculture sector, where R&D has been shown to be more successful when it is conducted in close contact with extension stations, ensuring the applicability of the solutions developed in the lab. 61 One example is the Latin American Maize Project, a multi-country partnership that successfully balanced developing public goods in terms of research and ensuring commercially viability. Close interaction between the public and private sectors can also ensure that governments adapt regulations and standards to facilitate the spread of innovation while maintaining appropriate consumer protections. Two prime examples are Airbnb and Uber, pioneers of the “sharing economy” that have faced push-back from regulators and from market actors whose businesses they are disrupting (lodgings and taxi services). Legitimate issues do arise, 62 but if lawmakers and regulators don’t understand peer-to-peer services and the value they add to the economy, they may cling to outdated rules that protect incumbents and stanch innovation. The role of demand in driving both invention and diffusion cannot be underestimated. Demand creates incentives for private-sector players to invest and provides a testing ground to improve innovative technologies, products and services. Strong demand is also crucial in starting the process of “learning-by-using” and “dynamic increasing returns” that derive from technologies being adopted by a critical mass of users. In the case of information and communication technologies, the interaction between technology providers and users generated a process of “co-invention” that was crucial to diffusing the benefits of the technologies more quickly and widely across the economy. 63 As mentioned earlier in the chapter, this is an important issue for low-carbon innovations trying to compete against well-established technologies. The most common tools for creating demand for low-carbon innovations are those pricing mechanisms (e.g. a carbon price or fossil fuel tax) and regulatory standards (e.g. energy efficiency standards) used to encourage widespread deployment, and discussed in more detail in Chapter 5: The Economics of Change, and Chapter 4: Energy, respectively. In this regard, it is worth mentioning the particularly large gap in creating demand for “bottom-of-the-pyramid” innovation relevant to meeting the needs of the world’s poorest populations. 64 Here too, international support may be critical to supplementing national policies. 65 In some cases, markets in lower income countries can become leading markets globally, as with disaster early warning systems. Increasingly, developing countries are as important as developed countries in the innovation process, and the low-carbon transition is not going to be a one-way flow of technologies from North to South. Demand for innovative goods and services can also be increased through more systemic approaches, such as creating industrial clusters to spur innovation and new technology deployment. A high-profile example of such a cluster is Silicon Valley, which a 2009 McKinsey & Company analysis identified as the highest-performance cluster in the world in terms of growth and number of patents granted by companies and sectors. Source: McKinsey & Company and World Economic Forum, 2009, adapted with permission from Juan Alcacer 66. As shown in Figure 6, McKinsey classified innovation clusters into four categories, based on their growth momentum and diversity: “hot springs” are small, fast-growing hubs; “dynamic oceans”, such as Silicon Valley, are large and vibrant ecosystems with continuous creation and destruction of new businesses; “silent lakes” are older, slower-growing hubs with a narrow range of well-established businesses; “shrinking pools” have little diversity or growth. Lessons from history show unequivocally that fostering strong market demand plays an important role in overcoming constraints to the invention and diffusion processes. The creation of innovation clusters, and the leveraging of public procurement and large-scale demonstration projects, have also shown to be effective means of fostering demand in more focussed ways to spur the broader innovation eco-system, enable user-feedback and co-invention, and overcome the inertia of network economies. Box 4 — What are intellectual property rights? Intellectual property rights are legally enforceable rights over inventions and other “creations of the mind”. The most important such rights for low-carbon technologies are likely to be patents, which allow the patent owner to stop the use of an innovation by others. They do not automatically allow the use of the patented technology by the patent owner, because the new invention may incorporate inventions already patented by others, for which permission to use must be sought. This is an important point. A patent also requires publication of the invention so that others may build upon the ideas it contains. Other intellectual property rights include copyrights, trademarks and design rights. With the exception of copyright, however, these are granted rights (i.e. they have to be examined and approved by a granting body), and they apply only to the country in which they have been granted. Most patents are applied for only in substantial markets where they will be manufactured, sold or used. Most companies do not file patents in Least Developed Countries (LDCs). Other than trademarks, which can last indefinitely, intellectual property rights have a limited life, which is generally 20 years in the case of patents. Statistically, radical new technologies take about 12 years after first patenting to reach the marketplace. Evolutionary technologies, which are usually less dominant, may reach the market in five years. In sectors with complex technologies and products, there are often many inventions (and therefore intellectual property rights), owned by different parties, which are used in the final product. Examples include mobile phones, computers and medical technologies such as magnetic resonance imaging (MRI). This situation is known as a patent thicket. Where patents covering some elements of a product are owned by others, agreements to grant each other rights to use the other’s inventions are called cross licences. Where standards are set, particularly where interoperability is important (such as mobile phones and TVs), patent pools may be created where patent owners make their inventions available, at predetermined prices for both putting them in and gaining access to the entire pool. Intellectual property rights are not the only means of protecting and encouraging innovation. Companies generally employ a number of other means of protecting and leveraging their innovations. These include strong internal processes for confidentiality, non-disclosure agreements, and non-compete contractual clauses; in some cases, such trade secrets can provide legal protection. 72 Companies also protect their innovations through non-legal means: by creating a rewarding environment for their innovation-related staff, by building market advantage as quickly as possible, and by continually innovating to remain ahead of the competition. Capacity: countries with weaker institutions are often unable to deal with the legal complexity of patent licensing and cannot finance the complex and long process of negotiations related to intellectual property rights. This example illustrates a fundamental issue with intellectual property rights. As indicated earlier in this chapter, public- and private-sector investment in innovation (particularly basic research) is often motivated by industrial policy and international competitiveness considerations. In practice, many countries choose to drive domestic market deployment of new technologies, and support them through intellectual property rights, clustering and tax incentives, in hopes of gaining an international competitive advantage. 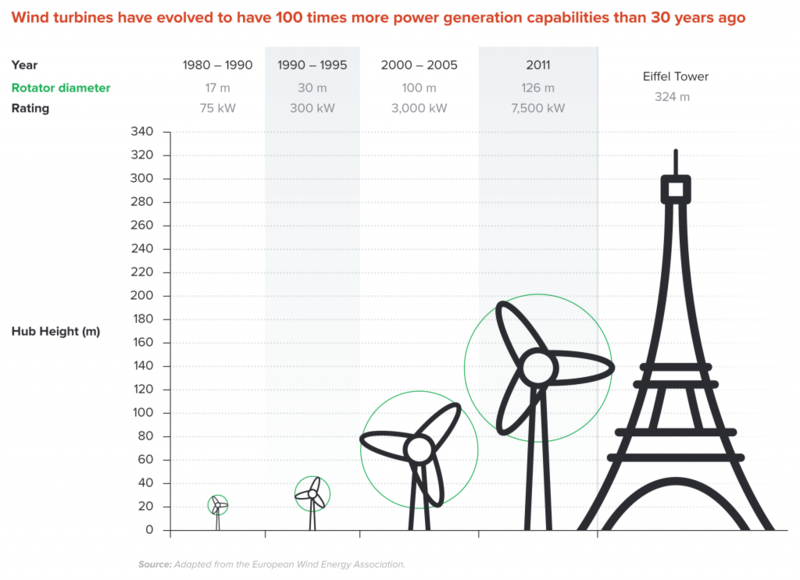 For example, Denmark deployed wind energy throughout the 1980s and 1990s, gaining an advantage when other countries looked to deploy wind in the 2000s. A similar pattern has been seen historically with high-speed rail, whereby France, then Japan, and then China deployed national rail systems, in the process creating leading global businesses in the sector. This is a desirable process, as it allows for innovation and, eventually, growth. Intellectual property rights are central to it. At the same time, the comparative advantage created for a country or company, once protected by those rights, increases costs and complicates access to the new technologies for everyone else. Access to technologies by poorer countries has been a hotly debated issue. These countries need to adopt low-carbon technologies in order to meet agreed targets for emission reductions, or indeed to transform their economies into sustainable, resilient low-carbon ones. The concern is whether they will be able to access those technologies at fair and affordable prices. While eliminating intellectual property rights cannot be the optimal solution, as it destroys incentives for investment, there is a need for mechanisms to accelerate the sharing of technologies with lower income countries, and to ensure that countries have the capacity to adopt and adapt those technologies. In fact, for most technologies, patents are not filed in poorer countries, as the size of the potential market and the complexity of procedures often discourages companies. In such cases, inventions can be used freely in the countries. The issue of transfer and capacity still persists, but patents do not create additional barriers. Many companies also offer differentiated prices to poorer countries, on the condition of non-leakage in richer countries. But when market sizes are large or leakage risks are perceived as higher, patents are put in place, and constitute barriers for technology diffusion. Even with patent pools in place, the cost of licensing will remain an issue. This could be addressed by setting up such a mechanism in conjunction with funding support by the Global Environmental Facility or the new Green Climate Fund to cover the cost of licensing. Both of these institutions include support for technology transfer within their mandate. In addition to bilateral collaborations, multilateral initiatives such as the Clean Energy Ministerial (CEM)82 and the Major Economies Forum on Energy and Climate (MEF)83 provide platforms for sharing best practice and exploring multilateral cooperation around clean energy with tailored arrangements for intellectual property protection. Identify effective, inclusive international forums for addressing intellectual property rights issues, and make it a priority to resolve disagreements that are impeding the diffusion of innovations. Given these issues’ implications for trade, the World Trade Organization may be the most appropriate venue for many of these debates. For low-carbon technologies in particular, the technology transfer institutions within the United Nations Framework Convention on Climate Change (UNFCCC) are also crucial, but they need to be streamlined and simplified to be more effective and ensure transparency and accountability. Support the development of patent pools for low-carbon technologies, with support from existing institutions to enable poorer countries to access them. The section above lays out a substantial agenda for government intervention. But there is significant debate about the role of policy in supporting the deployment of innovation, fuelled largely by fears of governments “picking winners” as acts of political favouritism. There also remain significant differences in the means employed by different countries to encourage innovation. Governments have a plethora of policies from which to choose to assist with deployment and scale-up of new technologies and business models. Some require government money; for example, tax breaks for businesses producing renewable energy or direct consumer rebates for the purchase of new technologies have supported significant market growth in solar, wind and certain building technologies and appliances, in both the EU and the US. Other deployment policies don’t require government money, but instead mandate that a market embrace new entrants via renewable portfolio targets, performance codes and technology standards. These regulatory measures have had impact in Japan, Korea, China and the US, among others. There is no single “right answer” for which policy instrument to use, although the above sections provide a number of insights into the types of policies governments should consider as they determine the best approach for their particular context. 85 Overall, harnessing innovation to drive down costs and improve performance requires a range of policy interventions in order to address multiple market failures, to cultivate the broad innovation ecosystem, and to support innovation at different points in the process (e.g. across invention and diffusion). Moreover, effectively implementing such a range of policy interventions requires a coherent innovation strategy and priorities, and stable funding. 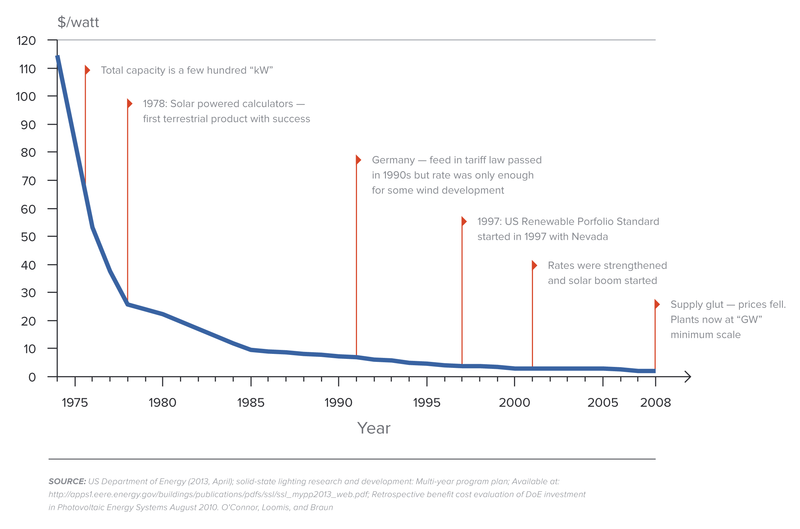 86 The case of US government support for solar energy (see Box 6) illustrates the success of comprehensive low-carbon innovation policies in radically improving cost and performance. Support through the US Department of Energy’s national laboratories to pioneer scientific discovery and new innovations that can break through the limits of current solar technologies. Financial policies to leverage private sector investment. This includes up to $4 billion in loan guarantees to overcome financial barriers to commercial-scale deployment and a 30% investment tax credit for residential and commercial solar systems. Support for projects that help solar manufacturers make improvements in a broad range of manufacturing processes across the supply chain. Targeted initiatives, such as the SunShot Initiative, to support research in existing solar technologies with the aim of reducing the costs to a nationwide average of $0.06 per kWh by 2020. Policies to alleviate workforce development barriers within the solar industry. This involves training programmes and sharing of best practices. Support for training programmes is provided at nearly 400 community colleges around the US, including programmes to provide skills to veterans; around 13,000 veterans now work in the US solar industry. Both broad-based innovation policies and targeted interventions are important to driving the development of new technologies. In previous sections, we looked at the potential impact of broad-based innovations in the areas of materials science and digitisation, and at the business model innovations integral to creating this impact. We also looked at related low-carbon innovation areas benefitting from these broader innovations, such as resource productivity and the circular economy; cities and sustainable buildings; and renewable energy. We showed the importance of broad-based policies to support innovation, and also showed how targeted support (see the US solar energy case study) has been critical to advances in low-carbon innovation. Targeted interventions are most essential for technologies that reduce market externalities, like avoiding dangerous levels of climate change. Such interventions are also essential to overcoming path dependency and the inertia of incumbency that may lead to under-investment in low-carbon technologies.93 Targeted investment in such technologies can have a transformational impact, and lead to large returns in the future.94 History shows that new technologies can take several decades to generate new products, often to meet needs and mitigate risks that are themselves difficult to predict. Hence, government support for early investment in potentially transformative technologies is crucial to manage risk in the future. Below we have chosen to highlight three examples of technologies that have the potential to be transformative in terms of reducing emissions, with substantial additional benefits: energy storage; carbon capture, use and storage, and advanced bioenergy. We also highlight the example of Tesla Motors, where a number of different technological innovations (including energy storage) were combined with business model innovation, leveraging an open-innovation approach, to create a potentially game-changing product. This does not mean to be a comprehensive list. Our aim is to highlight examples of innovations that have the potential to transform products and business models in the future, and to show the potential role of government in enabling such advances. Energy storage technology has advanced considerably in recent yearsas a result of increased R&D, a renewed focus on grid resiliency and reliability, increased interest in low-carbon transport options, and improved information and communications technology. Government decisions will have a critical role in determining the future of energy storage, particularly because storage does not fit neatly into the traditional utility business model. Policies should be designed to ensure that renewable energy and storage systems receive proper value for the benefits they provide while also paying their fair share of fixed grid infrastructure costs. At the grid scale, governments can play a major role in accelerating the deployment of energy storage by allowing storage to participate in well-designed electricity markets. Since 2011, the US Federal Energy Regulatory Commission has taken major steps towards this goal, through two orders that enable energy storage technologies to compete in the frequency regulation and ancillary services markets. 99 At the same time, government support for research, development and deployment can facilitate technological advances and cost reductions. The UK’s Department for Energy and Climate Change recently conducted competitions to award demonstration funding to new storage technologies. 100 As there are many technologies in the energy storage space, government policy should always be applied in a way that promotes competition between them. Tesla launched its stock in June 2010 on the NASDAQ Stock Market and saw its price increase by 40% in the first day of trading, valuing the company at US$2 billion and raising over US$226 million. It was the first initial public offering by an American automaker since Ford’s debut in 1956. By 2013, Tesla’s market capitalisation had grown to US$26 billion, even though the company was selling only 25,000 cars per year. For comparison, in the same year General Motors sold 9.7 million cars, with a market cap of US$54 billion. Clearly Tesla has managed to capture people’s imagination about the future of the automobile – and raised substantial capital in the process. The Tesla Motors story – from the outsourced manufacturing of the Roadster, the first fully electric sports car, to in-house production of the Model S, a fully electric luxury sedan – is a success story about open innovation. The idea of open (vs. closed) innovation is based on three fundamental observations: good ideas are difficult to protect and hence are quickly shared; innovation increasingly happens through partnerships and networks of firms and public institutes, rather than within an individual company; and it is very hard to hire and retain highly skilled workers. Key partnerships across the car value chain were instrumental to Tesla’s success. This includes supplier alliances, R&D alliances and Original Equipment Manufacturer (OEM) alliances with other automobile manufacturers. Lotus Cars and Panasonic were partners on supplies, crucially including batteries, while Toyota and Daimler were partners on other components of the cars. A partnership with Sotira (France) was crucial in the development of the carbon fibre body. Many of these alliances were based on equity, creating joint incentives for partners. These partnerships also allowed Tesla to leverage a broad accumulation of technology advances that had themselves benefited from government support. Recently, in line with its open innovation approach, Tesla released all its electric vehicle patents to the public, arguing that all car companies would “benefit from a common, rapidly-evolving technology platform.”101. Tesla managed to apply substantial innovation through the value chain, even in a mature and saturated market. It picked a very specific niche, foreseeing potential growth, and was able to effectively fix initial quality glitches. Through its open innovation partnerships, it benefited from substantial existing automobile and battery supply-chain experience, and developed internal expertise on the electric drive-train. Thus, while “cooking with the same ingredients” as other manufacturers, it managed to create a substantially innovative product. Tesla also leveraged public support for market demand (by selling US$130 million in zero-emission vehicle credits in 2013) and secured public lending to set up production facilities (a $465 million loan from the US Department of Energy in 2010, which it paid off nine years early in 2013). Finally, the company’s business model is to sell the car through factory-owned direct points of sale – similar to Apple’s stores – and it is working to remove market barriers by fighting regulations that would require franchised dealership to sell the cars. 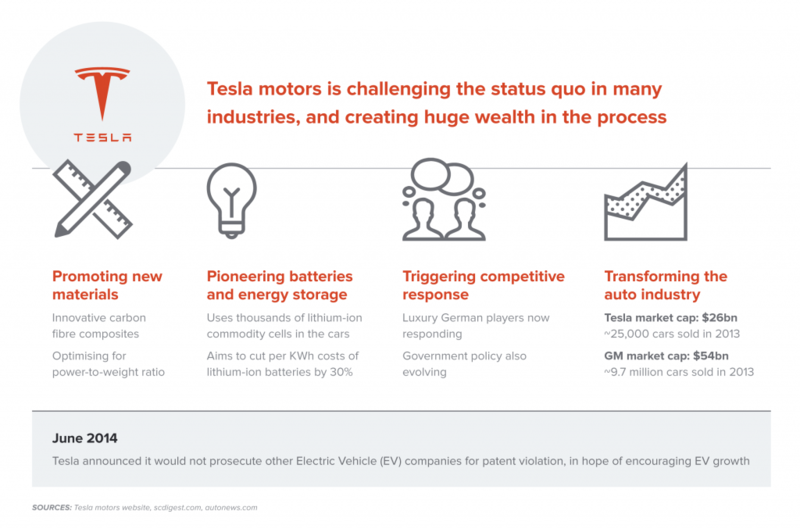 The latter is an important aspect of Tesla’s success, showing the importance of business model innovation, and the potential barriers to such innovation posed by incumbent models and government regulations that support such incumbency. The Intergovernmental Panel on Climate Change (IPCC) Fifth Assessment Report indicates that technologies to remove carbon dioxide from the atmosphere will likely be crucial to keep global warming under 2°C. 102 While the IPCC sees potential for extensive use of carbon capture and storage (CCS), on its own and combined with bioenergy, there could also be other, more profitable applications of carbon capture technologies at various scales in the future, should they receive the right support over the coming years. Carbon capture technologies have substantial room for improvement. For example, capture technologies for fossil-based power plants carry a heavy economic penalty by reducing their efficiency. A certain efficiency penalty is unavoidable, but there is wide scope for reducing it. Additionally, new research by a number of companies and universities suggests that carbon dioxide or methane can be economically captured from other, less concentrated sources, such as landfills, water treatment sites or even from the air, although the cost of this option is still very high. 103 At the same time, very long-term and secure carbon storage has yet to be proven, and further R&D and demonstration of storage methods remains critical, including in the areas of measuring, monitoring and verification, and mitigation and remediation of leakage. 104 Finally, the government has a critical role in creating a sound regulatory regime that ensures protection against potential storage-related accidents, and as a result, facilitates deployment by mitigating public opposition and reduces the risks for investors. Apart from enhanced oil recovery (EOR), no application has yet been able to simultaneously capture CO2 at a significant scale, avoid re-emitting the CO2 or using additional fossil energy, and significantly reduce the net cost of CCS, but further research may change this. Research in CO2 use is now being funded by the EU’s main climate innovation initiative, Climate-KIC, which has identified it as a priority research area. 107 All applications, including EOR, face the challenge that the mass of CO2 that must be captured to significantly reduce climate risk exceeds the conceivable demand for most products made from it. Even so, commercial CO2 use can greatly improve the economics of CCS demonstration projects and initial large-scale deployment. Breakthroughs in materials science are leading to new types of bioenergy that could conceivably replace a large proportion of fuels. The widespread use and/or displacement of food crops for biofuels in some countries, driven by poorly designed policies, has led many to oppose bioenergy as a threat to food security. However, there are many ways to scale-up bioenergy production without decreasing food security. Second-generation biofuels convert biomass to fuel, using dedicated energy crops such as miscanthus (a species of fast-growing perennial grasses), food waste or by-products of agricultural production, such as corn stover or sugarcane bagasse. In 2013–14 there has been significant progress in commercialisation of second-generation technologies, as several players have built out commercial-scale plants. One projection forecasts second-generation ethanol capacity in the US to rise from 12 million gallons per year in 2013 to 140 million gallons in 2016. 109 Other forecasts are more cautious, given difficulties in creating the new supply chains in feedstock and getting the conversion process to scale efficiently. Third-generation biofuels are typically made from microalgae, grown with waste carbon dioxide, generating minimal pressure on land and water resources. They are ideal for regions with substantial sunshine, non-arable land, and sources of carbon dioxide. While third-generation biofuels have not yet been deployed at commercial scale (and there are considerable scaling challenges), many pilot projects are operating successfully and attracting significant interest from biotech, genomics and software engineering communities. Development of third-generation biofuels will require further R&D, as well as incentives for investors to build the first commercial scale plants. Fast-growing trees and grasses can also be developed as a feedstock for bioenergy. While these clearly should not displace crops or forests, there is potential for fast-growing biomass to be developed on non-arable land and in harsh environments. Trees and grasses could be bred either for efficient carbon sequestration purposes or potentially as a source of biomass for energy, potentially as feedstock for power generation. Advanced bioenergy can also work in tandem with other game-changers. It can be an output of CO2 use, as algae-based bioenergy systems take carbon as an input. It can also be a means to store energy, as bioenergy can be stockpiled in the same way as fossil fuels. As with CCS, government has a role not only in providing R&D and demand incentives, but also in ensuring a sound regulatory environment that addresses public concerns related to, the impact on food security, the threat to natural forests and biodiversity, and the safety of genetically modified crops, among others. Create market pull for new technologies: To meet climate and economic growth objectives in the necessary time frame, every economy must put policy measures in place that help spur demand for clean technologies. Carbon pricing is the first critical instrument in using the power of markets to create such demand, and in the context of innovation it has two key advantages: it is technology-neutral (letting the market decide), and it sets credible long-term expectations. Alongside a carbon price, the Commission recommends that by 2015–2020 (depending on income level) all countries adopt performance-based, technology-neutral codes and standards that are continually ratcheted up over time. This is especially important in sectors where economic benefits are ample and price signals less likely to be effective (such as energy efficiency in buildings, appliances and vehicles). Finally, the Commission recommends that all countries and international institutions assess their public procurement processes and insert guidelines so that minimising energy use and carbon emissions become procurement criteria for all publicly procured goods and services by 2015-2020 (depending on income level). Public procurement has proven to be a large and credible market for technology developers, accelerating innovation, and supporting user-based refinements. Governments of major economies should at least triple their public energy-related R&D by the mid-2020s, to take it well over US$100 billion a year (exceeding 0.1% of their GDP), and target it towards game-changing technologies. R&D annual spending for new energy-related technologies in the major economies should be at least tripled by the mid-2020s to take it to its late-1970s levels, over 0.1% of their projected GDP in 2020, across public research, development and demonstration. In a rapidly changing sector in which more than US$6 trillion changes hands every year111, it is essential to invest at least US$100 billion per year to pioneer improved technologies. This would include a phase-out of support from more mature, “dirty” technologies, which neither offer large economic spillovers, nor suffer from market failures that inhibit demand. Other countries should also increase their support for climate-related innovation, with a focus appropriate to their local context. The energy sector is undergoing a transformation that has the potential to dramatically improve global human welfare. While solar and wind technologies are at, or approaching, cost-competitiveness, a number of others could get to that stage with additional, early-stage support. Coordinated programmes and roadmaps for game-changing technologies such as, among others, energy storage, carbon capture, use and storage, and advanced bioenergy will be of great importance. For more mature technologies, such as wind and solar, more R&D could be focused on driving continued technical improvements based on technology-neutral cost and performance targets. Encourage new business models by removing poor regulations and other barriers to entry. The Commission recommends that countries work with the private sector to identify and remove regulatory and other barriers to the adoption of new business models and technologies. Of particular relevance are regulations that inhibit the shared use of capital-intensive goods, such as cars, and regulations that deter entry into highly networked systems, such as the power distribution markets. Other examples include overly prescriptive input standards in building regulations, various electricity network standards favouring incumbent supply technologies, and the regulatory and tax treatment of reuse, remanufacturing and asset sharing. In addition, this should include separate, more favourable tax-treatment for high-risk investment, where lack of access to financing is recognised as a major barrier to the development and scale-up of new technologies. Establish a robust system of intellectual property protection and sharing, while supporting poorer countries in accessing, adapting and adopting low-carbon innovations. Developed and developing countries should recognise the need for clear and simple intellectual property rights to incentivise public and private investment in low-carbon innovation, but also acknowledge the need for mechanisms that expand access to these innovations. Governments and companies should promote the creation of patent pools for low-carbon technologies, and seek additional mechanisms for IP sharing. Financial and technical support to access these pools, and to drive innovation appropriate to the needs of lower-income economies, should be provided to poorer countries by bilateral and multilateral institutions such as the Green Climate Fund and the Global Environmental Facility. Such support should focus not only on direct technology transfer, but also on building the broader innovation capacity and local institutions required to adapt, adopt and further develop such technologies. “Nationally Appropriate Innovation Actions” could also be used to encourage and recognise countries that develop and share key low-carbon technologies in the context of an international agreement. Use realistic assumptions on cost trajectories for new technologies when making economic policy and public service and infrastructure investment decisions. Getting policy right will require understanding how the process of learning about new technologies will reduce their cost. Few ministries of finance around the world do this well because it is difficult to predict future technological change. But the default assumption that technology costs will remain constant is clearly incorrect. As we saw in the chapter, industries at early stages of development are typically on steep learning curves, yielding dramatic cost reductions. This has been seen across industries, from semiconductors to genetic mapping to smartphones. At a 10% performance improvement per year, a shift from two years’ backward-looking to two years’ forward-looking cost comparisons can reprioritise investment decisions. By systematically modelling and incorporating learning curves for new technologies, ministries of finance across the world can better decide how to allocate scarce resources.